Angie Payne Is Going Big! 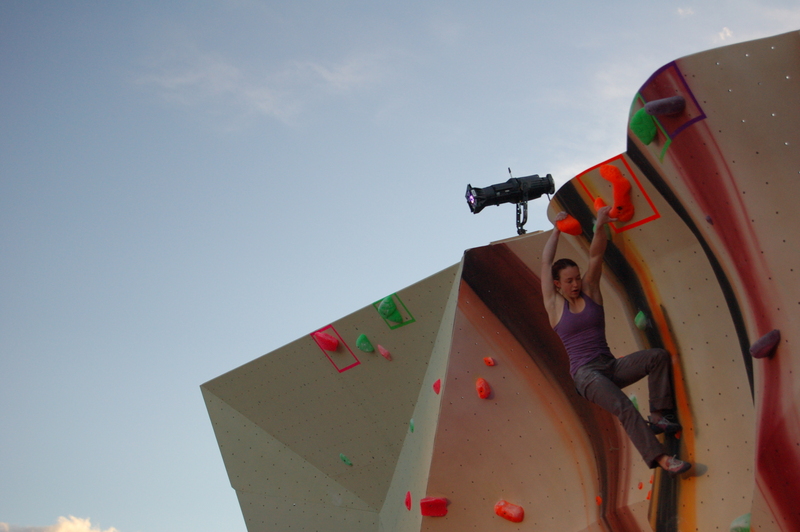 One of our favorite Boulder-based boulderers, the wonderful Miss Angie Payne, has headed off on a major expedition with Keith Ladzinski, Mike Libecki, and Ethan Pringle. Payne has started a blog where she will talk about the expedition (and other climbing-related stuff) and so far it is quite good. See it here – Angie Payne Blog. What does this have to do with The Spot? While checking out her expedition info I realized that Angie’s athlete page on trip sponsor Mountain Hardware’s site has an interesting section where she talks about a moment that changed her climbing. 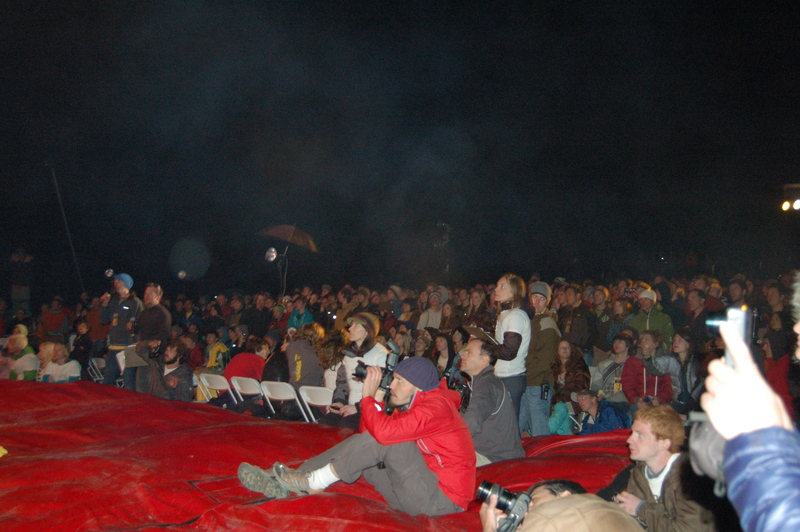 The moment she is talking about happened at the 2010 Battle In The Bubble. 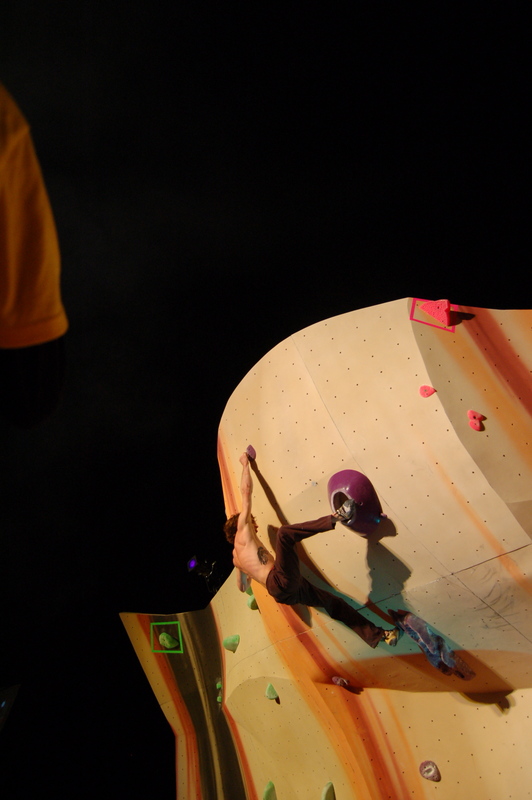 Angie was a major competitor for many years, though in the mid 2000’s she seemed to retire from comp climbing for a while. 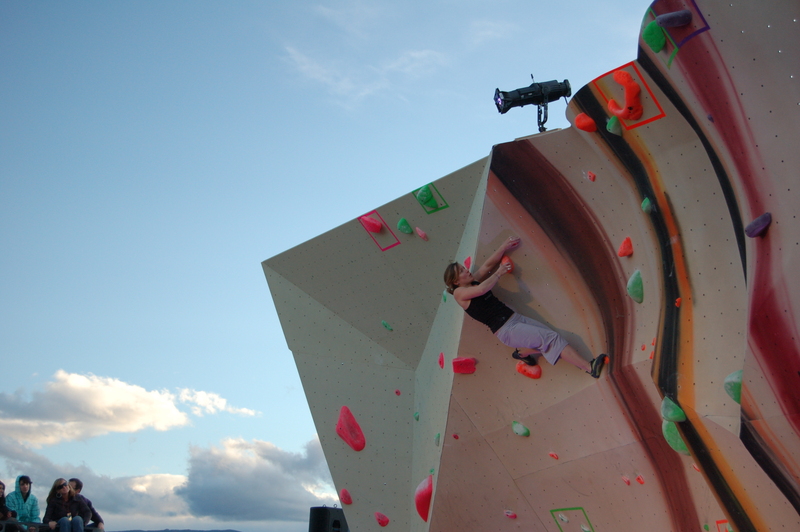 Then she got hurt, came back, began competing again, and a few months later became the first woman in the world to climb a confirmed V13 when she did The Automator at Rocky Mountain National Park. 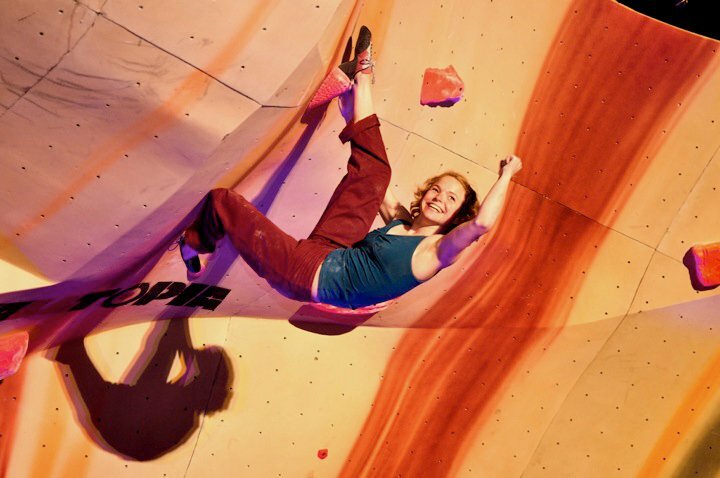 It is cool to read that the Battle In The Bubble competition was so much fun for Angie and that it had such a positive effect on her climbing life. Have fun in Iceland and Greenland Angie!!! 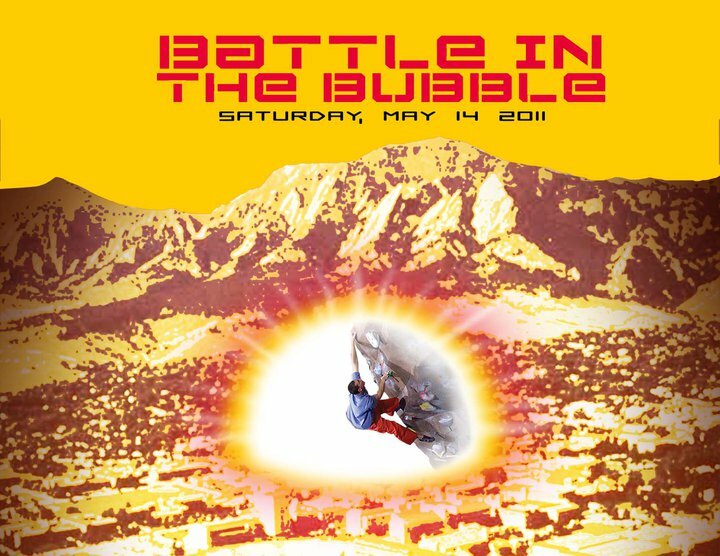 There is one more comp to go in SBS Season VI, and after that we’ll be gearing up for the Battle in the Bubble 2011! 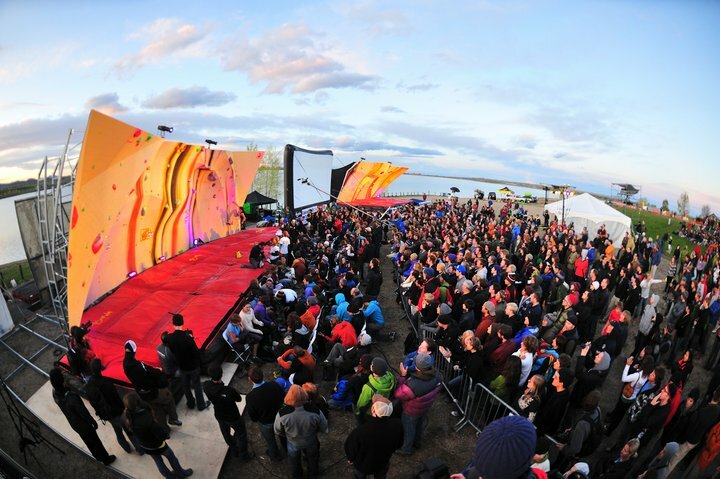 Gravity Assassin Productions will be producing the event, and I’ll keep leaking info as it comes to me. You can also find ’em on Facebook. 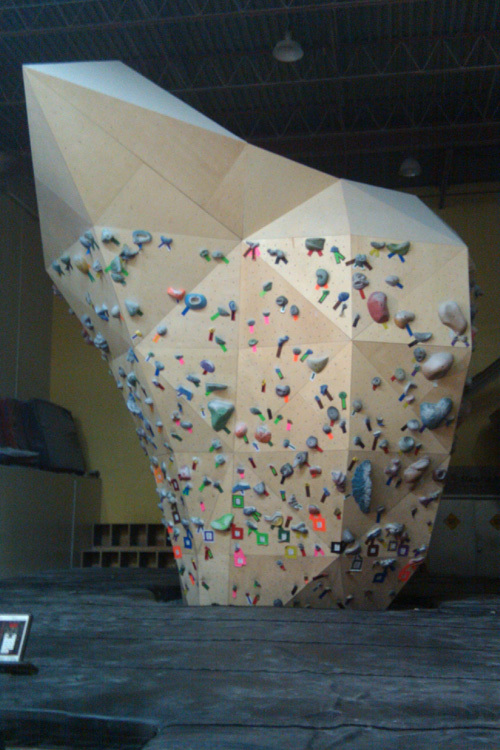 A new boulder at the Calgary Climbing Center. Sick! Pic from the Tekkies blog. If you look to the left sidebar under “Useful Info” you will see a new link for tekkies. Tekkies is the Teknik handholds setting blog, and one of their setters is Tondé Katiyo, who you may remember from the few problems he set at The Spot a few years ago, or from his part in the crew at the 2009 UBC Summer Tradeshow Comp or the 2010 UBC Nor’easter event. Tondé has written some very interesting (if you’re a setting nerd) and detailed discussions about some recent setting jobs he’s done. I highly recommend checking them out. Also, you might also want to check out L’ouvre Boite. The site is owned and run by Tondé and 5 other French setters who have teamed up to offer a little more professional, unified setting product. I think it’s an interesting way to approach the idea of professionalizing setting. Yes, it’s really late. No, it’s not edited any more thoroughly than the women’s video. 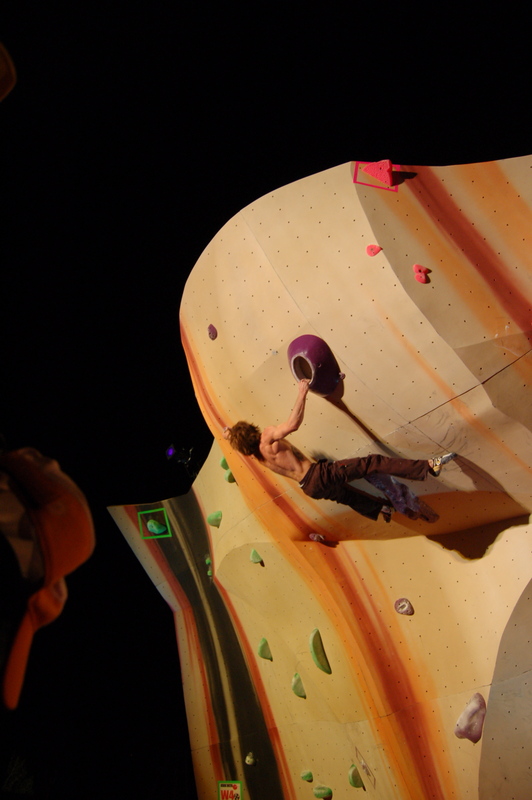 Includes footage of several different climbers and all 5 problems (not complete for a few of ’em though) and climaxes with Daniel Woods’ ascent of Semi 5. Enjoy! Today, Wednesday, June 2, is the grand opening day for the New Wall. What does this mean for you? 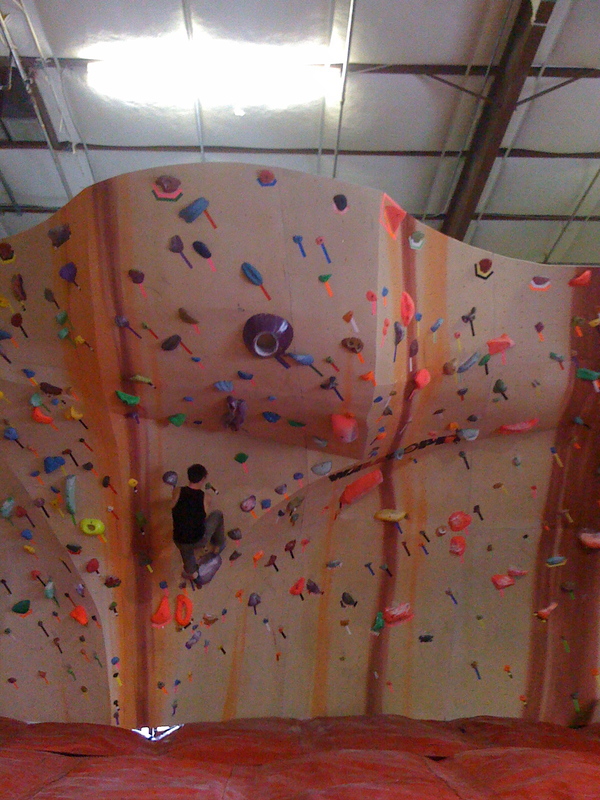 FREE CLIMBING ALL DAY!!! So bring your friends who aren’t members to check out the gym and talk them into joining! 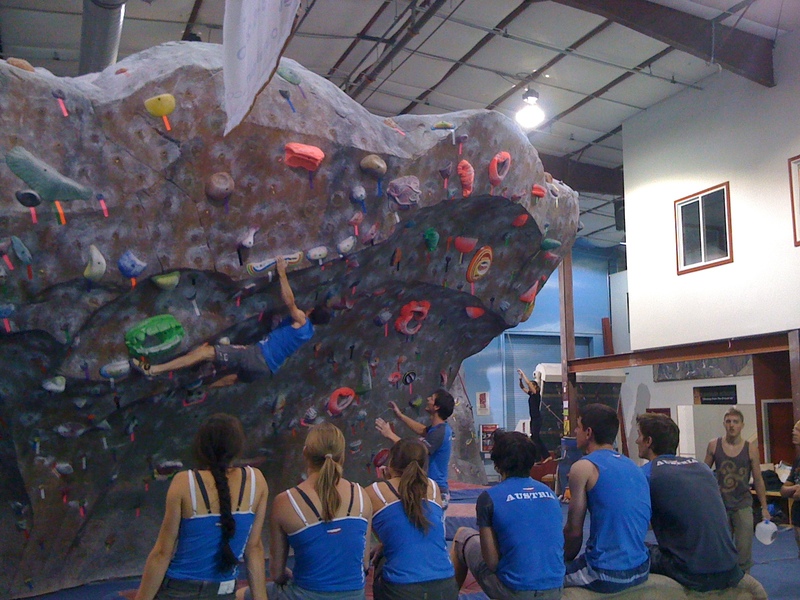 We are also offering $5 daypasses on Thursday and Friday, and a summer membership special of $125 for 3 months of climbing. They’re really good deals, so don’t miss out. 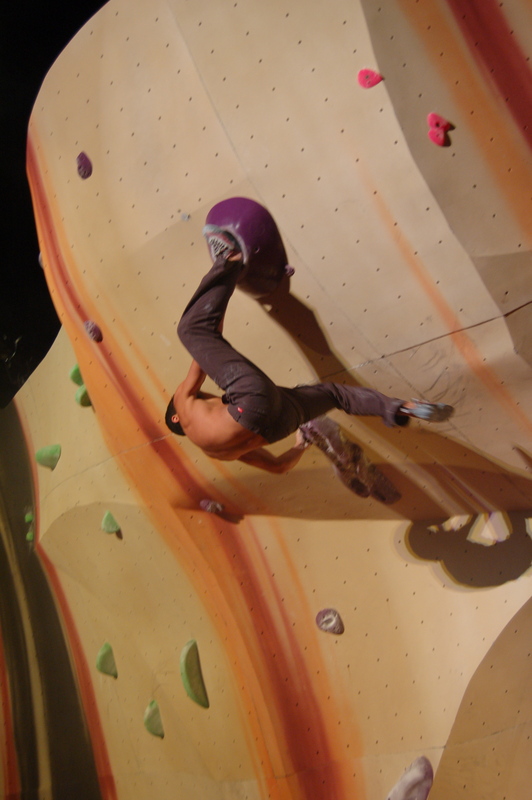 Carlo is jumping to the blue ring (below the purple Hueco). So far he is the only one who has stuck this dyno out the belly of the new wall. Last week we finished the post-Battle gym reset, and this week we’re adding a bunch of problems to fill the walls in better. Yesterday it was the Font, and today, I’m not really sure, you’ll have to come by and see! Also yesterday, the Austrian team (and one of the Germans) showed up at the Spot to prep for the upcoming World Cup in Vail. It was quite fun to watch them climb on the semifinals and finals from The Battle in The Bubble. See you at The Spot today!!! The setters all attended semifinals so we could get a good feel for how the competitors were climbing and make sure we didn’t need to make any tweaks to the difficulty of the finals problems. I brought the little Flip camera my mom gave me for my birthday and shot some video of various people climbing various problems. This video is of the DRCC Women’s Semifinals problems (though the first two are non-DRCC cause we didn’t have enough holds). Most of the women who competed are in it, though I missed Audrey Sniezek and Kristen Felix–sorry girls! The edit is pretty rough cause I didn’t have a ton of time, and I decided that comp background noises would give you a better feel for how things were going than a techno track would, so the original noise is in all the clips. I’ll put a guys one together when I have time. Enjoy! 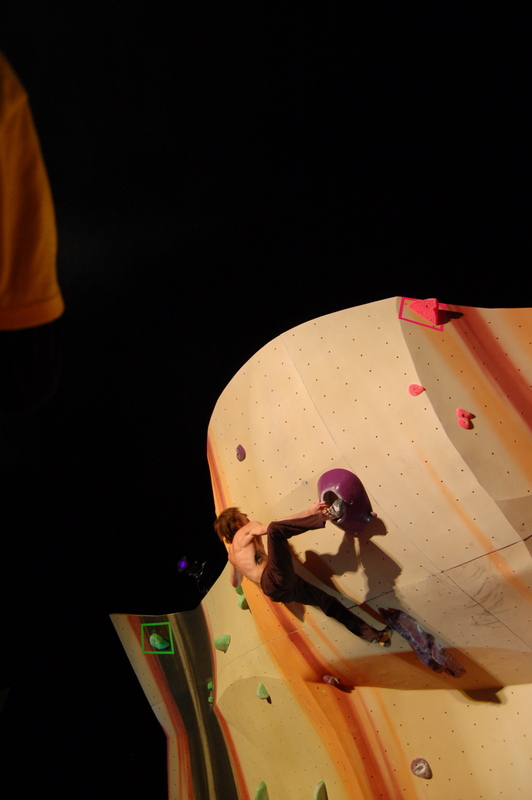 Obviously, Men’s Final 5 had to be a really hard problem. 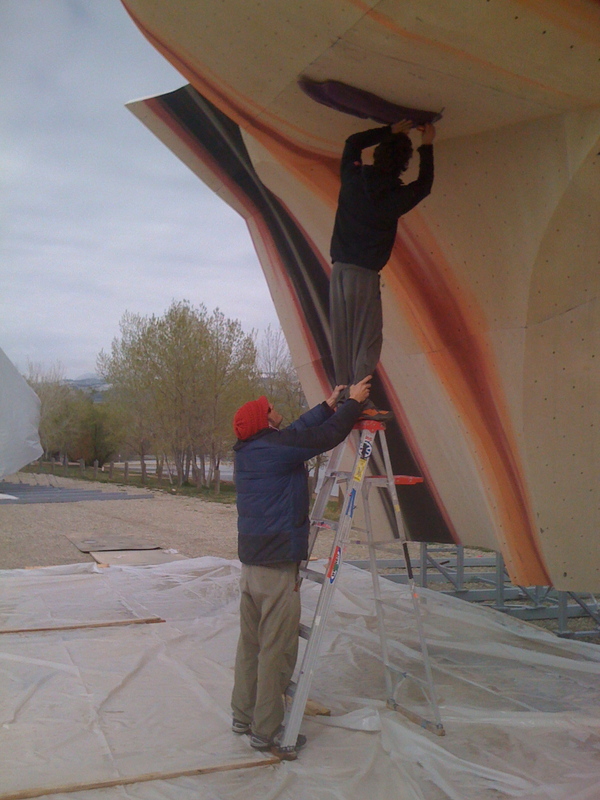 The bulk of the problem was set by Jonny Hork, who took one look at the big purple Climb-It tufa and set to work screwing it on the steepest part of the roof. 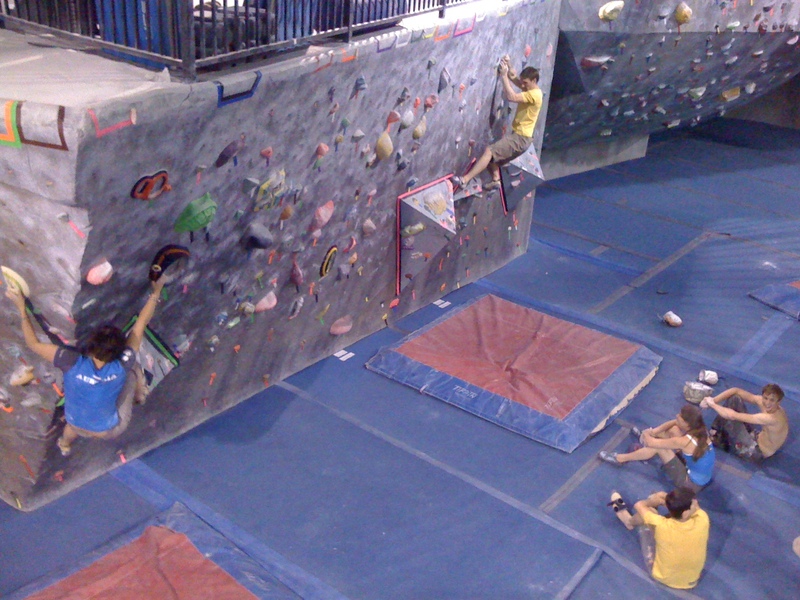 First hold on the wall. Doing an incredibly powerful flag move to the hold far out left. Straining to reach the left hand hold, but he wasn't quite long enough in the position he was in to grab a hold of it well enough to move on. 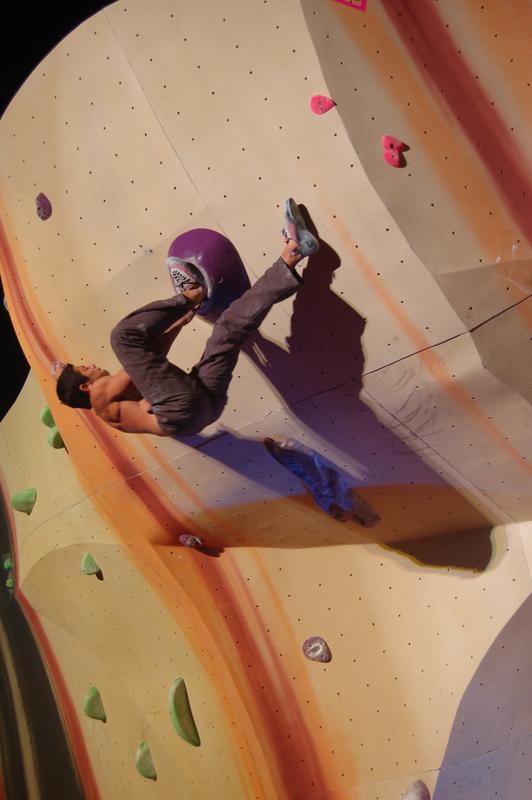 Daniel kept his feet low and used a left foot heel hook on the tufa for the hand move out left. He matched his right foot on the tufa, moved his left heel to a toe, and now he's in a good position to get his right heel up with his body already high. 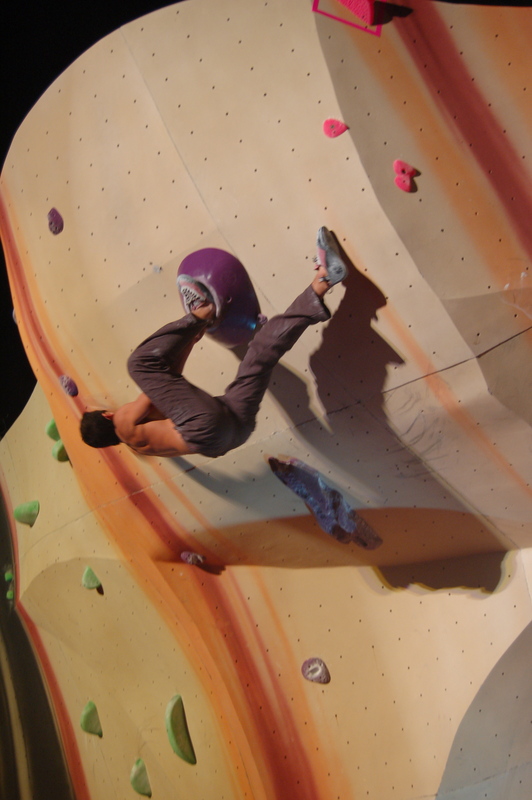 With a high body and good heel, he can do the powerful move to the next high right handhold. 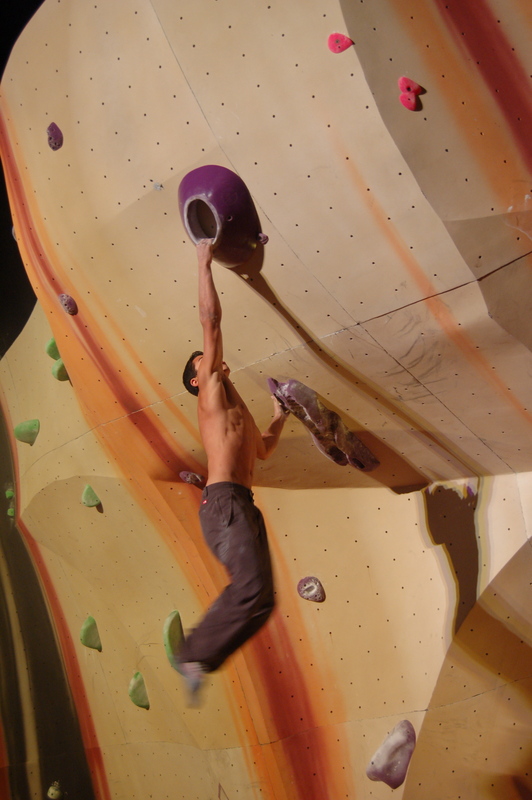 On his first two tries, Daniel did these same moves, but he seemed to be barely hanging on. Before this try he had a 2 minute rest, and it showed. In this sequence he is much stronger, and locked off much higher on his left hand and right heel, so the move to the high right hand isn’t so stretched out this time. Also, his foot cut isn’t quite as dramatic as the one you saw in this post: Battle in The Bubble Goes Off HUGE!!! This go, his last, he easily got his feet back on, hucked sideways for the finish hold, and somehow, magically, stuck it. The crowd went absolutely wild, competitors rushed the mats to hug Daniel, and everybody had huge grins on their faces. It was a fantastic ending to a great event. More Battle in The Bubble!!! It was cold, but the crowd was pretty huge! There are also many pics showing up on Facebook and Keith Ladzinski took a bunch that will be showing up soon. Stay tuned!